How Y-JOBS unique to me as an employer? Y-Jobs is a 100% Overseas Jobsite with foreign skilled professionals and workers holding work authorization (Green card, PR Visas or Work Visas) available locally or overseas. Many of these professional's work and PR visa have been processed by us and their documents have been verified. The resume bank also contains experts requiring sponsorships and those willing to relocate overseas. Our resume contains the best and the brightest from India who are experts and who speak English and have global exposure. 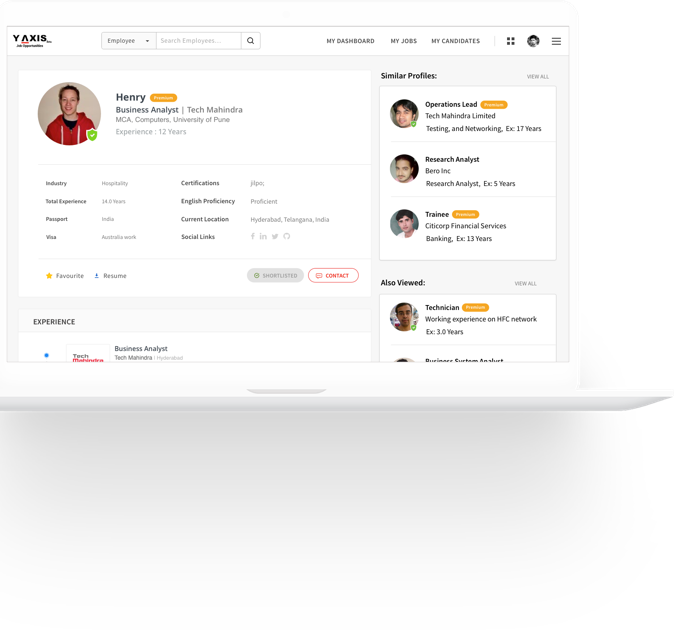 You can choose to post your jobs and search for candidates for free. 40 offices in India, UAE and Australia. Why should I post my jobs? What are the benefits? First, it's free to post your job with no strings attached. It's free to contact our premium members who have applied for your jobs. Why should I search for candidates here? If you are looking to recruit skilled professionals from overseas with work authorization. Our resume bank contains the best and the brighest from India who are excepts and who speak English and have global exposure. You can contact the candidates directly. Many of these professional's work and PR visas have been processed by us and their documents have been verified. It's free to post and search. You can contact our premium members for free and our basic members at a low cost of $10 per profile. Y-AXIS also offers complete staffing solutions. Y-AXIS is a licensed recruitment consultant offering staffing solutions to meet your short and long term recruitments needs. Please contact our Account Manager at accountmanager@y-axis.com for customized solutions.